A flight of Luftwaffe "Wolves" sweep along the French coast seeking evidence of any incoming threat from across the channel, or even a chance engagement. 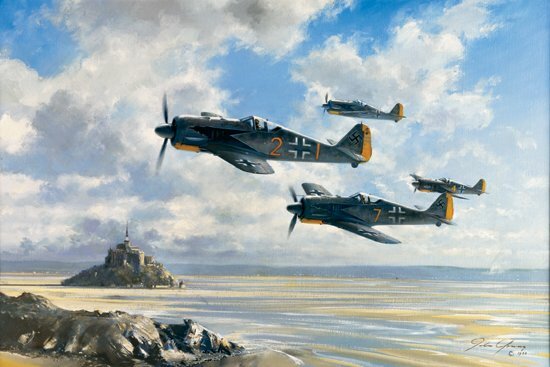 FW190-A5s from 9/JG2, the "Richthofen Jagdgeschwader" patrol the beach at Normandy's Mont St. Michel on a summer day in 1943. Image Size: 24.5" x 16"
Paper Size: 30.75" x 22.5"
Sacred Mount Fuji seems to stand with these patroling Zero fighters to protect the homeland. For centuries the Japanese worked to shield their culture from unnecessary and unwanted foreign influence. With their role shifted from conqueror to defender, these zero pilots face what seems an uncertain future. 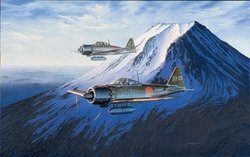 In the Summer of 1945 Wotakeo Tanimizu, an experienced combat pilot and ace with some eighteen victories, leads a flight of A6M52C Zeros from Kagoshima Air Base on a home defense mission.